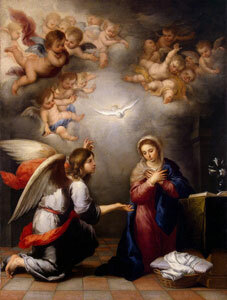 Today the teenage Virgin Mary said yes to the Angel Gabriel: she would be the Mother of God. They say that all of heaven, even God Himself, hung upon her answer, like a young man proposing to his lady. This was no game, no mere formality. For when God asked Mary for her whole life and future, He could have accepted no for an answer if He had had to. The only love that means anything to Him, or to us, is love freely given. It cannot be forced. So great was the dignity of that young Virgin Mary, and so great is ours. She said yes to God’s will for her, and so must we. This is the heart of holiness, to accept and accomplish God’s will in our very different lives.